People Eating Together entries discuss that age-old tradition of people coming together to tear each other apart — Cannibalism! So settle in, maybe grab some coffee or a snack(! ), and let’s explore this last social taboo together – because you can’t practice cannibalism alone. Sometime in about the year 2007, while bored at my job at a children’s textbook publisher, I fell down a Wikihole about cannibalism. In between reading about Sawney Beane and Jeffrey Dahmer, I ran across the Franklin Expedition, which is to Canadian history what the Donner Party is to American. The article was fascinating enough, so imagine my excitement bordering on hysteria when I reread the article in 2017 to find that AMC was making a TV show about it. I loved the show, and immediately listened to the novel on which it’s based. There are significant differences which I’ll go into in the spoilers section of the review, but for now let’s focus on reviewing the show. Good morning! This week my co-author Achariya and I were able to attend an advance screening of The Shape of Water. We loved it and we had thoughts. The following are those thoughts. The section here is spoiler-free, but spoilers do appear in the discussions below the cut. Enjoy, and feel free to chime in! JEN: Let me get this right out of the way – I loved it, I want people to support it, but I also recognize it’s not for everyone. Also there were three movies that I couldn’t help but think about: Amelie, for the love story, Splash, also for the love story, and The Creature From the Black Lagoon, mostly because of the Amphibian Man but also because that latter touched on concepts of loneliness. Breathe water or breathe air – get you a man who can do both. ACHARIYA: Last night when I left the theater, I called my dad, a cinephile from way back. I told him the bare outlines of the plot, and he said, “Oh, obviously Guillermo Del Toro is a student of film, and has also seen Frankenstein and Bride of Frankenstein — he’s likely well versed in the genre of the relatable monster.” And yes, I also loved it. JEN: Also I can’t help but think of this as Del Toro thumbing his nose at Universal’s failed attempt to launch a Dark Universe franchise; I read that he was offered the Dark Universe and turned it down. Had he taken it on we would be seeing a Creature From the Black Lagoon remake very like this, along with all the other well-loved monsters. Here’s a man who can’t write an unsympathetic monster, who will always see layers to every villain but most of all to the ugly, unloved, and broken. It’s a damned shame we won’t see those from him. JEN: One more thing before we get into the spoilers – I found the movie brilliant because of the complete removal of its universe from reality, while still managing to feel believable. All the questions I had stemmed from situations that were created within the movie – there was never a moment where I thought ‘Well that can’t happen because X.’ The story had my complete buy-in. 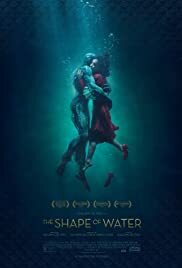 I want you to know three things about The Shape of Water. Beautiful, lyrical, and absolutely deserving of the buzz surrounding it; the fact that there is so much buzz around it and that people are appreciative of such a daring story is wonderful. Marvelous, in that it literally contains marvels of all sorts. Acting, effects, imagery, characters, sets, dialogue, music, production, you name it, there is something in this movie to dig into. Inspiring a much, much longer review from my co-blogger Achariya and I that we will hash out tomorrow and post in the next day or so. I will keep general comments above a cut, but deeper discussion will need to contain spoilers so those will go below the cut. Man. That was something. I cannot WAIT to write more, but it’s late and this sort of thing requires a proper marination of the brainmeats before anything can be said.